You are here: Home / What’s a Cube? Earlier this week I was browsing Zodiac duelist and came across something that peeked my interest. The particular individual wanted to know how to build a Cube, which immediately gave me my article topic for the week! I first learned how to Cube draft in Michigan with Jeff and everyone at Voltage Games and I was immediately hooked. Cube quickly became one of the things I looked forward to the most when I visited Michigan and I wanted to bring the draft back home to my friends in Wisconsin. So What’s Cube All About? Cubing is as simple as finding 4-8 of your friends (or enemies! ), sitting down at a table, and having a good time playing a different kind of Yugioh. If you aren’t familiar with how to Cube draft I will be more than happy to explain. When the draft begins you are given various pre-constructed packs of cards that contain randomly chosen cards from the cube’s card pool. You should have three pre-constructed packs, which typically have around 15-20 cards in them. Some people like to put extra deck cards in these three packs, but I personally like having a fourth extra deck pack (Typically containing 10-15 cards). The argument to having extra monsters in the regular packs is to force players to value a Stardust Dragon (or what have you) over a main deck card. This does add more skill to the drafting process, but a lot of players have had more fun with the extra pack in place. With my cube, we always draft the extra deck first because it allows you build the remainder of your deck around the extra deck cards you selected. When you open your first pack you get to choose one card from it and then pass the remaining cards to the left/right. This drafting process continues until you have an equal amount of cards you started with, which can vary depending on participants. When you open your second pack you have to pass those cards in the opposite direction to create more variation in the draft (You also don’t want to pass to the same person). Here’s a quick summary of the order of operations when people draft with my cube. Shuffle the entire main-deck cube and sort the cards into packs. Two packs of 15 and one pack of 20. Shuffle the entire extra-deck cube and sort the cards into packs. One pack of 15. Open the extra-deck pack and pass to the left/right until you have finished the drafting process for the extra deck. Open the first pack of 15 and pass in the opposite direction you just did. Construct your deck and play. I mentioned earlier that pack size would vary depending on the number of participants. Think about it this way, if you have four people playing, and there’s around 400 cards in the cube, you would want to see as many cards as possible to build the deck you want. With only four players I like to make each main-deck pack contain 20 cards, which should unlock more of the card pool for the smaller amount of players. Building a Cube is kind of like designing your very own format of Yugioh, which should help you decide what kind of cards will be healthy/un-healthy. It’s important to note, that cubes should have no more than one of each card that you add. That means that there should be no multiples of any cards in the draft. The very first thing I can recommend to anyone building a Cube is to implement the Battle Pack Three rules to it. 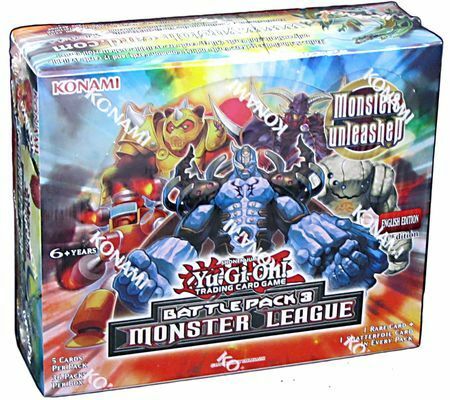 Battle Pack Three Rules state, “All monsters are considered all types anywhere”. These rules make for awesome card interactions and just a wider array of more consistent and powerful cards. In the past people’s cubes have consisted of lots of archetypes from Dark World monsters to Gladiator Beasts, but when I’m drafting I don’t want to pick an archetypal monster and hope that someone else hasn’t bet on that same archetype. With the Battle Pack Three rules you can pick any card and should it have some function with almost any other card in the cube. Battle Pack Three rules create a safety net for deck building, which is invaluable to beginner and expert level cube players. I cannot stress enough that throwing an entire archetype into a cube is a very ineffective way of constructing a healthy and fun cube. Think about it this way, you wouldn’t build a Nekroz deck with one of every card. When you build a deck you want it to have various ways to tutor its overriding goal, whether you’re trying to control the game or combo into a big field of monsters you need more than one copy of a card to do that. Thanks to the BP3 rules, there is a vast amount of cards that you can add to your cube’s card pool. One of the most common examples I can give for this paradigm is a floater. Under the BP3 rules, there is a plentiful amount of monsters that can replace themselves via special summon or search. Cards like Pyramid Turtle, Howling Insect, Goblin Zombie, and Masked Dragon give you plenty of options to supplement your deck with floaters. With so many cards that have similar function, you will find it very easy to build a deck with all the pieces you need. Arguably my favorite monster to use under the BP3 cube rules is Rescue Cat. Rescue Cat’s effect is already good enough to keep it banned in advanced play, but once Cat loses its limitation to only special summon Beast-type monsters, it becomes one of the best cards to draft. One of the coolest combos with Rescue Cat is using it in combination with Hushed Psychic Cleric. Cleric says that you can discard a card to banish a Psychic monster from your graveyard, then if Cleric is sent to the graveyard, you can special summon the monster that you banished with its effect. Since all monsters are all types under BP3 rules, you can banish the Rescue Cat that you used to bring out the Cleric, synchro summon using a tuner brought out from Rescue Cat (into a level 4/5/6 synchro monster), and then bring back Rescue Cat. One of my other beloved monsters to manipulate in Cube is Lonefire Blossom. There’s various ways to resolve Lonefire blossom multiple times a turn, which can make for some pretty awesome plays! The simplest combo is to use Lonefire Blossom to special summon Red-Eyes Darkness Metal Dragon (RedMD) from your deck, and then using RedMD’s effect to bring back the Lonefire and keep going off. Cards like Athena and the Creator allow you to unlock Lonefire’s full potential because they allow for more recursion. Imagine if you had RedMD, Athena, The Creator, and Lonefire Blossom! Lonefire and Rescue Cat are some of the best cards in cube, but what other monsters are good? Here is a list of some of the best main-deck monsters to utilize in BP3 draft play! You may notice that next to some of these cards, I have given a recommendation that you ban them from your own cube (BP3 rules make them too powerful). The two monsters I listed above that fall under this category are Mind Master (an already banned card), and Super Ancient Deep Sea Coelacanth (Super Fish). Mind Master was something I was reluctant to ban because I had a lot of fun setting up massive unbreakable fields with his power, but eventually I realized that he was too over powered. Super Fish is another completely ridiculous card in this draft because it can special summon as many level four or lower monsters as possible from your deck with the only limitation being that the monster’s have their effects negated. Super Fish tailored to the right cards can result in instant game shots, which is something I wanted to avoid in draft. Think about it this way, if you had Lonefire Blossom, you could use its effect to bring out Super Fish from your deck! 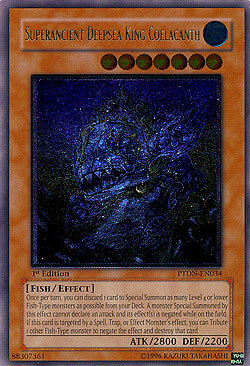 Then use Super Fish’s effect to flood the field with more monsters to continue playing with. If you do want to use Super Fish in your cube, I hope you heed this warning. One of my favorite aspects of cube is getting to use cards that have been never been legal during my competitive career. Everyone has that one banned card that they have always wanted to play, whether it’s Painful Choice or Chaos Emperor Dragon there is surely something exiting for you to use! While using banned cards is fun, there are some that should remain illegal, even in a custom format. After all, you’re cubing for fun, and there’s nothing fun about being locked out of the game by something degenerate. Outside of soft (or hard) locks, there are a few other things I have personally omitted from my own cube due to being far too powerful (or not fun). When you play a regular game of Yugioh, you loathe seeing your opponent play a card that prevents your deck from playing. Knowing this, why implement cards like this into a Cube where people are coming together to play for money or fun? While some players love locking their opponent out of the game, I know that a large portion of duelists don’t appreciate being locked out of the game. 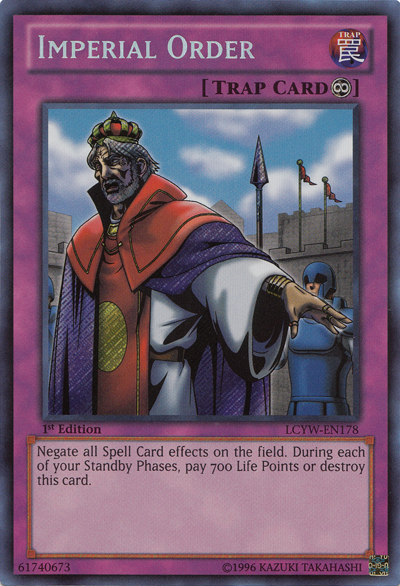 One of the first cards that left my cube was Royal Oppression. Oppression is often the topic of debate for cards that should return to advanced play, and I could not disagree more. Floodgates are horrible for the game, not to mention a floodgate similar to Vanity’s Emptiness that you have control over. You can create a field of monsters and flip up Royal Oppression when your opponent tries to break it and there’s almost no way they can come back from that. Following along the path of cards that don’t let you play Yugioh, I recommend that Imperial Order never graces the sleeve of anyone’s cube. Imperial Order is largely a free out to every single spell card that’s activated, which is extremely unhealthy. The best cards in your deck are usually spell cards because their effects advance your gamestate and supplement your monsters. If someone flips Imperial Order, they relinquish both players’ right to use the best cards in their deck. I’m sure a pattern is becoming clear in that almost all floodgates should be omitted from cube play because they contradict what cubing is all about, playing. Here’s a list of some of the floodgates I’ve elected to ban from my own cube, may this list be a set of guidelines for things to never include in your own cube (Unless you’re a masochist). Cards like Macro Cosmos, Skill Drain, and Soul Drain should have never been in my cube in the first place. I vividly remember drafting and seeing them in packs passed to me. I often thought about taking them to just avoid losing to them, but there was always a better card in the pack. Once packs simplified down to five or less cards, I then took it upon myself to take cards like Macro and Skill Drain because I didn’t want to lose to them. People often ask me for my cube list, and I would be more than happy to share it, but first I’d like to explain how I found some of the cards that are in my cube. Aside from using my memory of cards I saw in the cube back in Michigan, I went on Dueling Network and searched for cards with “type” keywords. For example, if I wanted to find cards that worked in “fish” decks, I typed in “fish” in the description bar. I repeated this process with every single type and compiled a list of cards I wanted to use in my own cube. Obviously some of the cards I needed were very obscure, so it took some time to get everything together. Obviously you can cut your workload down by just looking at the BP3 card pool! Aside from searching for “type” specific cards, you should turn your attention to the current ban list. Lots of banned cards are a lot of fun to use in cube draft because they allow you to compete with people who may have opened up a tier 0 pick in their first pack. Tier 0 picks are cards like Rescue Cat, Lonefire Blossom, Dragon Rulers, and Deep Sea Diva (The list goes on). For anyone that would like a list of my cube I will try to make that available as soon as possible, but with the Holidays on the horizon it may be difficult to find some time to type up that big list of cards! If you have any lasting questions about Cube feel free to leave a comment or message me and I will try to respond at my nearest convenience. ARG Orlando is coming up very soon and I hope to see as many of you there! Until next time, Play Hard or Go Home!